Real Life LEED: LEED Platinum Renovation Publishes Full Set of Documentation! 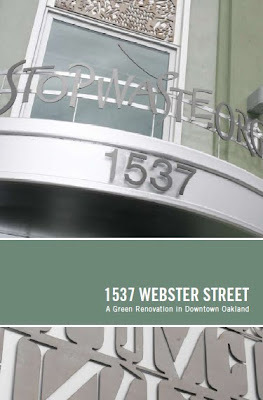 LEED Platinum Renovation Publishes Full Set of Documentation! Thanks to a heads-up from Wes Sullens of StopWaste.Org, Real Life LEED is happy to announce another full set LEED NCv2.2 documentation is available online! To see links to other complete sets of documentation just click here. Alternate Headline: StopWaste Stops Waste - Mission Accomplished! Perhaps equally helpful is a well prepared case study that explains some of the process lessons learned and describes the systems used (they even capture the rainwater falling on the solar panels!)... There's also a great online dashboard showing updated utility use and PV generation statistics for the facility. The only very small issue I have is that on the 6th page they claim that "As of December 2007, we are proud to announce that we're... the first LEED-NCv2.2 Platinum renovation project in the entire nation." Sorry guys, but that honor goes to my hometown outfitter shop Half-Moon Outfitters, who announced their achievement of a LEED-NCv2.2 Platinum Certification on July 16th, 2007. They took an old Piggly Wiggly turned auto-repair shop and turned that into a super-efficient distribution warehouse, maintaining pretty much all the structure. Though I had to point that out, I don't mean to detract from the accomplishment, and as I'm sure most of you will agree about feeling grateful for these guys helping to make LEED a little easier by sharing their work. Thanks! Know of a some project documentation online that I may have missed? Please let us know by sharing a comment... it's the only reason I found out about this, so please help out! Oh my GOODNESS! This is FASCINATING. I'd be happy with your LEED Platinum Renovation Publishes Full Set of Documentation!. I would like to personally thank you for your excellent stuff. they submitted to USGBC for certification. It's really amazing! I like it so much..